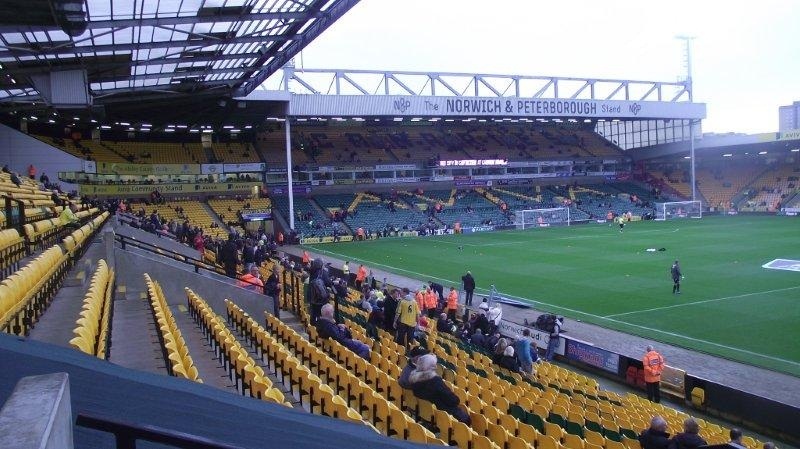 A few thoughts on the Norwich 1-0 Arsenal league match – Shocking!!! | "It's all about the Arsenal"
A few thoughts on the Norwich 1-0 Arsenal league match – Shocking!!! Well it was Saturday and proper football was back on the agenda after another rubbish international lull. I get up after a nice lazy lay in, shower, get ready, go to kitchen and have a well needed full English breakfast, the works. Ready and fed I am now just chillin’ awaiting my ride at 1pm to take me and Son to the match against Norwich. Neill turns up sharp after 1pm and we set off up the M11 -A11 and a trouble-free journey right to the ground. Parked up in the Riverside Car Park and came out into what is the street for Norwich night life. Pubs. clubs and restaurants. 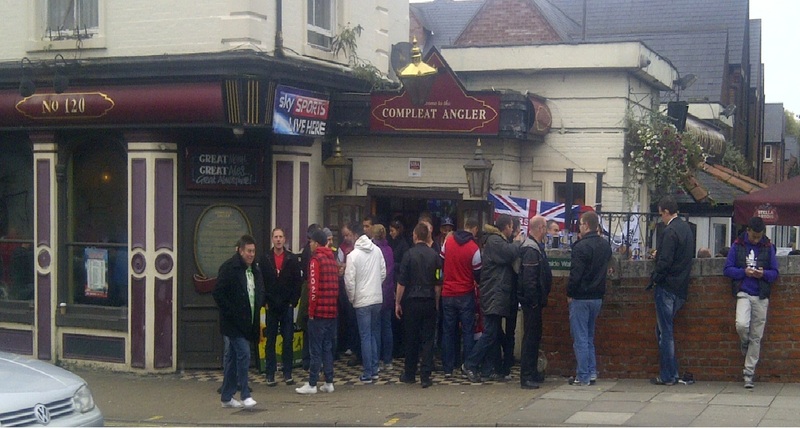 We decided that Costa Coffee was in order for refreshments which was right opposite the Compleat Angler where hordes of Gooners had congregated for a beer or two or twenty. After coffee, it was a 10 min walk through the Riverside to the ground. When we arrived we had to walk around the ground to the away supporters section in the Jarrold Stand. Went through security. Security? I could have taken a sub-machine gun in.. Showed tickets at Turnstile and walked straight up onto the terrace to look for our seats. shortly afterwards the rest of the players arrived on the pitch at around 7.10pm. 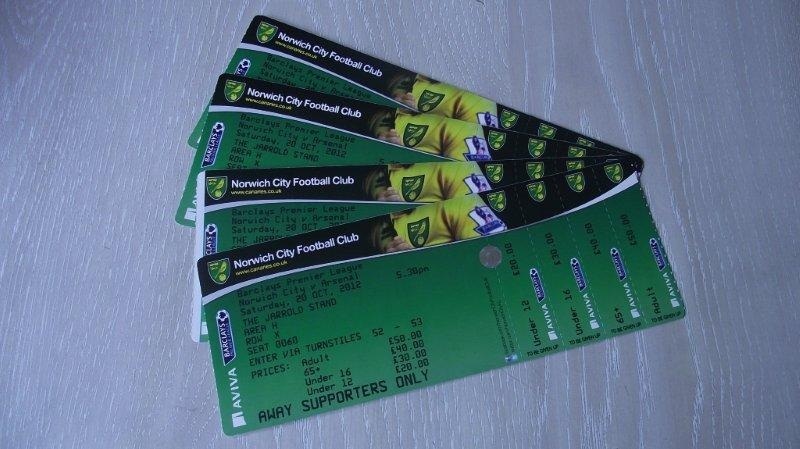 Norwich had already gone home with three points by then. The atmosphere amongst the Arsenal supporters seemed good, plenty of cheering and singing going on… I would say Arsenal supporters seemed pretty confident of three points, though you take nothing for granted in the premiership where any team can beat any other team, but in general the bigger teams will mainly win. Arsenal had not lost here since 1984. This was long before Sky TV took over and many football fans of today (who think football started in 1993) got into the game. The team was: Mannone; Jenkinson, Mertesacker, Vermaelen, Andre Santos; Arteta, Ramsey; Gervinho, Cazorla, Podolski; Giroud. Subs: Martinez, Wilshere, Oxlade-Chamberlain, Djourou, Coquelin, Arshavin, Gnabry. and referee Probert get them game underway. Come on you reeeeeds!!!! Around this time the late all day drinkers arrived and as at away matches no one actually sits down, there were about four late-comers in front of us. One of them started shouting out…B****ocks… S**t… F**k…. T***ers… C**ts…Wa***rs… get the ball in the area… B****ocks… S**t… F**k…. T***ers… C**ts…Wa***rs… Tackle the ball… B****ocks… S**t… F**k…. T***ers… C**ts…Wa***rs… Get stuck in… This guy was making sentences up out of swear words… Now I can be partial to saying a few choice words myself and I get it that if you takes kids to football there is going to be a bit of industrial language. I mean this guy was so out-of-it I was not sure he knew what was going on. Arsenal playing keep ball and thus keeping the home crowd quiet. However, this early dominance seems to have taken any sting out of Arsenal, there seems to be no urgency as if all they had to do today was turn up, collect three points with the minimum of effort and then look forward to the Champions League match against Shalke. Norwich look to have caught on the Arsenal’s game plan and are suddenly looking far more confident. The way Arsenal are playing is giving Norwich a boost. Norwich think they can get something out of this and are playing the ball up to Holt who is causing the defence a bit of problem. 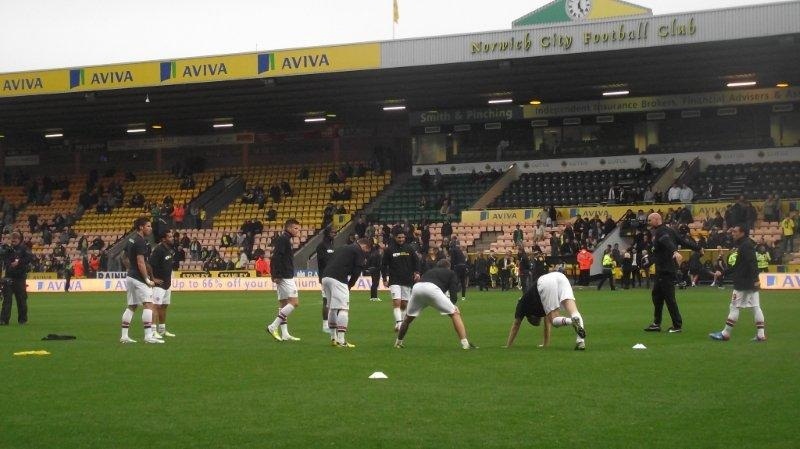 Thankfully no other Norwich players seems interested in joining him up front. Hold up, Arsenal have a corner and Cazorla takes it and Giroud is there to glance his header straight into Ruddy’s hands. Norwich are up for this now… The Canaries are like buzzards that smell food, circling and Arsenal are doing their level best to feed them and getting worse as the game progresses. In front… B****ocks… S**t… F**k…. T***ers… C**ts…Wa***rs… Referee is a W***er… That was poor tackle on Cazorla though and Johnson goes into the book. 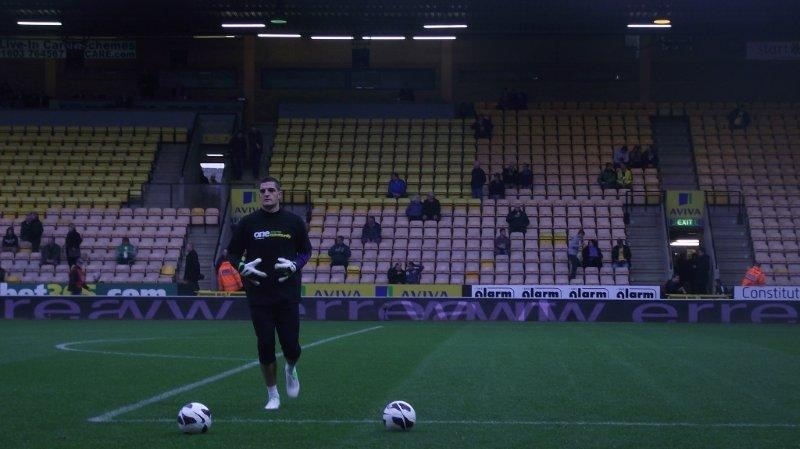 Oh dear oh dear, Mannone’s confidence (if he had any) is shot to pieces. A through ball is put into space by Hollahan and Mannone should sweep that up all day, everyday, however, he dithers and this allows Holt to get the ball and cross low into the area where thankfully Jenkinson was there to clear the danger. In front… B****ocks… S**t… F**k…. T***ers… C**ts…Wa***rs… Waaaaaaake up Arsenal…. Gervinho is playing just like the waste of space as he was at West Ham, he was better in Star Trek. He takes a shot which is deflected to Giroud who could only hit his volley at Ruddy. Arsenal get a couple of quick corners, which in truth the opposition are happy with as Arsenal don’t do corners. Both come to nothing. Arsenal are getting worse… In front… B****ocks… S**t… F**k…. T***ers… C**ts…Wa***rs… We’re S**t… Argggghhhh!!! Norwich have a corner which Pilkinton whips it in and that should be 2-0 as no Arsenal defender can be bothered to mark or jump and Turner gets no prize as he heads it back across the goal wide… Dear oh dear how bad are we playing… Liverpool won here 5-2!!! Arsenal get yet another corner and for some reason Cazorla decides to take it with his left foot, why? No surprise it comes to nothing. Norwich 1-0 Arsenal. That was without doubt the worse I have seen Arsenal play for sometime. Time to sit down for a few minutes. Surely things can only improve in the second half. Oh look would you… The guy in front with a vocabulary of 10 words has not returned to his seat. I thought I had lost my hearing at first. Arsenal get the second half under way. Pass, Pass, Pass, Pass, Pass, Pass, Pass, Pass, Pass, Pass, Pass, Pass, Pass, Pass, Pass, Pass, Pass, Pass, Pass, Pass, Pass, Pass, Pass, Pass, Pass, Pass, Pass, Pass, Pass, Pass, Pass, Pass, Pass, Pass, Pass, Pass, Pass, Pass, Pass, Pass, Pass, Pass, Pass, Pass, Pass, Pass, Pass, Pass give the ball away… Norwich have parked the buses… Apparently between 6.15 and 7.05 in Norwich you can only get around by foot or car. Cross comes into the area aimed at Holt, but Santos does well to stop the danger and Arsenal going 2-0 down… Doesn’t look like this are going to improve much. Chance!!! Jenkinson crosses, Ruddy thinks he is Mannone, flaps but Giroud cannot get his overhead kick on target. Did I say chance? Arsenal are not looking like getting back in this game anytime soon, they look so disinterested. Norwich look so comfortable… Not sure what Arsene’s game plan is here, you could almost be forgiven for thinking he is throwing this game with Shalke in mind. Arsenal once again having plenty of the ball but doing sod all with it. They just cannot get beyond the wall of yellow jerseys and local buses. Podolski leaves the game to be replaced by Oxo… Maybe he will breathe a bit of life into Arsenal. but not as Gervinho knows it. Ball comes to Oxo right below us and he knocks it forwards outpaces both Norwich defenders in close proximity and gets a knock on his hip for his troubles. Arsenal still cannot get going. Norwich still looking comfortable… Gervinho crosses and finds a Norwich player. Class!!! Ramsey too soft in tackle with Holt. Holt gets the ball, knocks it past the BFG and runs towards goal and for me shoots to early and the ball goes flashing wide… Nine mins as sub and Oxo goes off to replaced by Arshavin. Just about sums up the early evening to be honest. Another mistake, this time by TV5, who falls over his own feet and leaves Holt in on goal. Holt gets to the edge of the box and has the audacity to try to chip Mannone. Now that was no Liam Brady and I think Holt must have though Mannone was two feet tall. Trying to be a bit cocky there Grant. Giroud has wild swing at volley. Gnabry shoots wide… This is not good and time ticking away. So bloody glad I’m not watching this on ESPN… Oh look would you!!! Arteta has a long-range low drive and Ruddy goes down and take it in his midriff… Are you watching Mannone, that’s how you do it. Tea Bag is now down faking injury, wasting time… Not sure whose time he thinks he is wasting as Arsenal are in less of a hurry than Norwich are. Good ball from Gnabry to Wolf, who gets out his laser-measure to check distance to goal, consults a mathematician on the best angle to shoot at goal and let fly, but by now Bassong is back to throw himself in front of the shot and danger is gone. Sod off back to Klingon.. Corner comes to nothing. The BFG is now up front as Arsenal look to go route one. Two more corners come to nothing. Just what trouble does the BFG cause from free-kicks and corners? Knock down from Giroud see Gnabry slice his volley wide. This is followed by Cazorla doing the same. The final action as referee Probert blows the whistle for full-time… The Norwich crowd react like they have just won the Champions league… Arsenal players look sheepish and struggle to walk over to the away fans and applaud. They know they have been awful. I have since heard that Arsenal actually flew up to this match. I mean took a plane 114 miles from Luton to Norwich to a match, maybe I could be forgiven in the way Arsenal played that in fact they all cycled to the match. That was a shocking match to watch from an Arsenal point-of-view. Standing there for 90 mins bored to death by an Arsenal side that had no idea, no fight and no passion… I often feel that Arsene has matches where is he not too concerned… His thinking being that win against Shalke and three wins out of three in the Champions League you’re as good as through to knock-out stages. This is not saying he would throw a game, but he must have clearly expected us to be able to win this match and for me just told his side to win with minimum of effort. I can’t remember a game where we made so little chances of note. As for the players, I would say only Jenkinson and Arteta were worth even marking out of ten. The rest deserved nothing. Team effort 0/10… After match we decided to let the traffic calm down and for the fleet of local Norwich buses to get back onto the streets. We went down to the Riverside for some nose-bag and ended up in Pizza Hut. After 50 mins in there left to go back to the car park. 9pm.. Anyway, today is Sunday… Went to watch Son play football and they won 3-0. I’m not getting to hung up about the match. We lost, and #Shithappens. Time to look forward to Shalke and hopefully we cannot play that bad again. ← Do I want to pay high prices to go to football?